Open auditions will be held Monday, April 9, from 5 p.m. to 7 p.m. and Tuesday, April 10, from 5 p.m. to 7 p.m. in Room 1721 of the Haas Center for Performing Arts. To attend an audition, please sign up at the Louis Armstrong Theatre box office, call 616-331-2300 or email Jack Lane at lanejack@gvsu.edu. Grand Valley State University dance seniors Jenny Barreca, Emily David, Liam Shaffer and Bailey Swogger will be presenting their senior dance show "Link" on Friday, April 13, at 7 p.m. and Saturday, April 14, at 2 p.m. "Link" is an eclectic dance performance that will explore the dark sides of the human mind and the intricacies of human beings, and will include eight of the students’ original choreographed works. The dance concert will take place in the Dance Studio Theatre, Room 1600, in the Haas Center for Performing Arts. Grand Valley State University music professor and conductor Ellen Pool is holding auditions for the choral ensemble for the fall semester. She encourages students who have a background in music and enjoy participating in a structured ensemble to consider joining. The Department of Music, Theatre and Dance at GVSU offers five different choral ensembles for students to choose from, with the more advanced ensembles requiring an audition. Interested individuals should contact Pool at 616-331-2572 or poole@gvsu.edu for more information. She will be holding auditions from now until Sunday, April 15. On Friday, April 13, there will be an unveiling of this year's edition of Grand Valley State University's creative publication "Fishladder," which includes the creative pieces of GVSU students, ranging from creative writing to studio art. 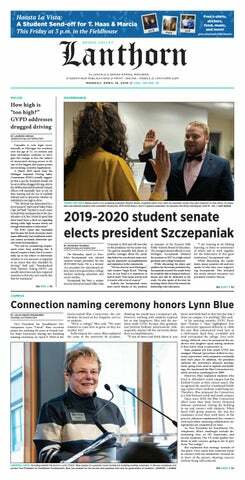 The unveiling will take place in Room 164 of Lake Ontario Hall from 6 p.m. to 8 p.m., and will feature readings of contributors, refreshments and the opportunity for GVSU community members to claim their copy of this year's edition. On Monday, April 9, at 7 p.m., faculty members Pablo Mahave-Veglia, cello player, and Gregory Crowell, harpsichord, will be performing the second half of the complete Vivaldi sonatas. Mahave-Veglia is a music professor at Grand Valley State University, and Crowell has played music, lectured and conducted in multiple European countries, as well as Japan, Canada and the U.S. Guest artists Joel Spears and Jerry Fuller will also be playing in the concert. The recital, which will take place in the Sherman Van Solkema Recital Hall in the Haas Center for Performing Arts, is free and open to the public.